Prior to this past weekend, I had spent 4 days downhill skiing in my life. Despite being born in snow, I never went skiing when I lived in Canada, so my first chance was on a dorm trip during my freshmen year of college. Amongst the chaos of fitting more than 60 people into a 20 person house, I also skied for one day. I fell a few times but mostly had a good time without really figuring out how to ski correctly. I went again after college for another day and had a similarly uninspired experience on almost exclusively greens. 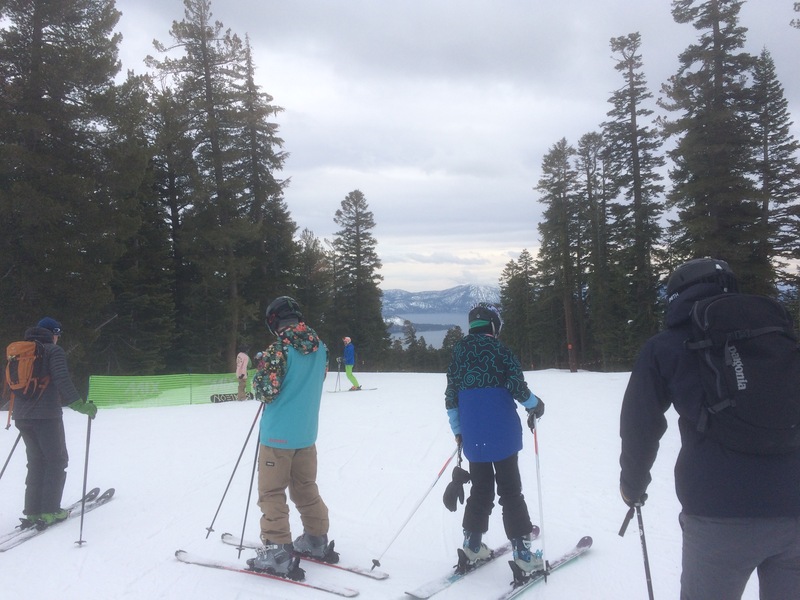 Two years ago, I went skiing on our company’s annual Tahoe ski trip and had a great time. By lunchtime on the first day, I was skiing blues and didn’t look back from there. Something clicked, and skiing suddenly seemed much easier. I skipped last season, and when I decided to ski again this past weekend, I wondered how the day would go. Would the technique come back to me like riding a bike, or was that last trip the anomaly? I hoped to warm up by going down a gentle green run, but convenience pushed me forward more quickly than I had expected. Our house for the weekend was three houses from the end of the block, which backed onto a run that led down to a lift. Rather than taking a shuttle to the gondola, which would get us to the easy runs, we decided just to ski in. The hill didn’t look too bad, but while I was clipping into my skis, I got a little nervous. There was no practice run, and the rest of my group was already headed down and would be waiting for me. I pushed out onto the run and picked up some speed into my first turn. And it went great. I had to remind myself to get into the right position and where to distribute my weight, but just like last time, I got right back into the rhythm and feel and managed to stay on my feet for the rest of the day. I didn’t do anything harder than I had tried last time on the normal runs, but I did add in another completely new skill: jumping. In the afternoon, I joined some of my coworkers who were headed to the park area with rails and ramps. On the next run down, I hopped a few jumps and managed to get one non-trivial jump with a split second of airtime that felt like an eternity. I panicked in the air but not enough to miss my landing, so I cruised down recovering my breath. On my third and last run, I did my second and final non-trivial jump with a rough landing that strained my back, so I went back to the usual runs. So five days and two jumps later, I think I’m an okay skier. I may be slow, but I can get to the end without (usually) hurting myself or falling. I wouldn’t trust myself to teach someone else how to ski, but I feel like I get how to do it. I haven’t skied in powder, but I could give it a good shot. I’m not sure how my progress compared to a typical learning curve, but I’m glad I got over the hump. After my first two times skiing, I wondered how much work it would take, and even after I got it, I wondered if I would remember. Now, I feel better having it as a lifelong skill in case I ever become James Bond and need to escape goons chasing me down a mountain. I’ll make some ridiculous comparisons and note how much harder it is to speak Chinese than it is to learn how to ski. Both skills have adherents that have spent countless hours mastering, but the minimum bar for saying “I know how to ski” is quite different from “I know Chinese.” There’s a big gap in the specific aspects to each skill but also a related point of how much you need to know for the skill to be useful. So I’m not sure how much I will ski in the future. I enjoy it, but I don’t enjoy it enough considering the time, money, and effort to do it. I’ll happily go along with friends and for any events but probably won’t make an effort to go on my own. I think I’m comfortable at my minimally useful skill level.